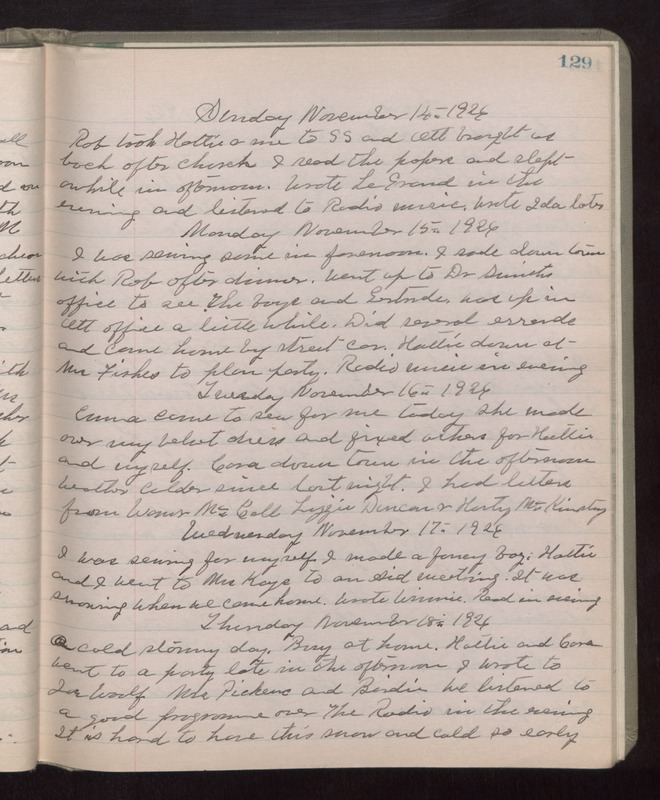 Sunday November 14th 1926 Rob took Hattie & me to S S and Ott brought is back after church. I read the papers and slept awhile in afternoon. Wrote LeGrand in the evening and listened to Radio music. Wrote Ida later. Monday November 15th 1926 I was sewing some in forenoon. I rode down town with Rob after dinner. Went up to Dr Smiths office to see the boys and Gertrude was up in Otts office a little while. Did several errands and came home by street car. Hattie down at Mrs Fiskes to plan party. Radio music in evening. Tuesday November 16th 1926 Emma came to sew for me today. She made over my velvet dress and fixed others for Hattie and myself. Cora down town in the afternoon. Weather colder since last night. I had letters from Warner McCall, Lizzie Duncan & Harty McKinstry. Wednesday November 17th 1926 I was sewing for myself. I made a fancy bag. Hattie and I went to Mrs Kays to an Aid meeting. It was snowing when we came home. Wrote Winnie. Read in evening. Thursday November 18th 1924 A cold stormy day. Busy at home. Hattie and Cora went to a party late in the afternoon. I wrote to Joe Woolf, Mrs Pickens and Birdie. We listened to a good programme over The Radio in the evening. It is hard to have this snow and cold so early.